The Epistula ad Afros, a letter to the bishops of the diocese of Africa which was probably written approx. 366/367 CE, is an important witness to the theological position of Athanasius in the period after his return from his last exile, a period given little attention up to now. In reference to synodical history as of the middle of the fifties in the fourth century, he expressly puts the Nicene Creed in the foreground of his thoughts as the only orthodox and catholic confession of faith. The present volume offers a translation and individual commentary on the letter from the viewpoints of philology, the history of dogma, and theology. The introduction deals with the following: the transmission of the letter, addressees, date of writing, genuineness, form and genre, relationship to other writings of Athanasius, language, style, forms of argumentation, and structure of the letter. 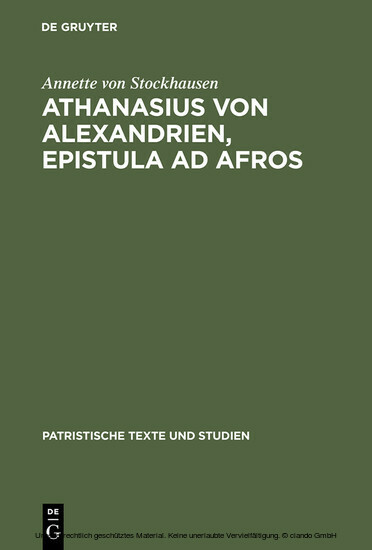 Die Autorin ist wissenschaftliche Mitarbeiterin an der Arbeitsstelle Edition 'Athanasius Werke II' in Erlangen.